It was quite a day for Waterford’s Shane Bennett. Shane Bennett celebrates scoring a goal for Waterford tonight. FOR MOST THE conclusion of the Leaving Cert is a time to finally relax and celebrate. Shane Bennett clearly never read that script. The student in Blackwater Community School in Lismore finished his Leaving Cert exams at 5pm today before travelling 60km to Páirc Uí Rinn to play for Waterford against Cork in the Bord Gáis Energy Munster U21 quarter-final. 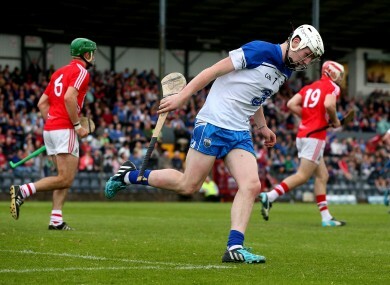 And he certainly played his part in striking 1-4 from play as Waterford swept Cork aside to record a 10-point win. Bennett’s exploits saw him land the man-of-the-match award and he told TG4 in his post-match interview that his mother had piloted the journey after his exams finished today. Shane Bennett fires to the net for Waterford tonight. Shane was one of three Bennett brothers from the Ballysaggart club in action for Waterford tonight with his older brothers Kieran and Stephen playing at full-back and centre-back respectively. It’s not the first time that he’s been juggling hurling and studies. Ten days ago Shane came off the bench to make his senior championship debut for Waterford and he hit 0-2 in their Munster semi-final win over Cork. That game was sandwiched between his Maths and Irish exams. Now his attention turns to a Munster senior final on 12 July against Tipperary or Limerick and a Munster U21 semi-final on 16 July against Clare. Email “Finish Leaving Cert at 5pm, travel 60km to Cork, win Munster U21 man-of-the-match at 9pm”. Feedback on “Finish Leaving Cert at 5pm, travel 60km to Cork, win Munster U21 man-of-the-match at 9pm”.